This work examines text-referencing practices and ideas about sacred texts in antiquity. This book shows how Ezekiel, an ancient Israelite author, borrowed from and transformed an earlier text containing religious instruction. Ezekiel used this earlier text (Lev 17-26, the "Holiness Code") in order to explain the sixth-century destruction of his city and the exile of its inhabitants, and to create hope for the exilic community of which he was a part. It was precisely because he regarded this text as authoritative and paradigmatic for his own day that he borrowed its words and phrases and transformed them for inclusion in his own work. The techniques behind these transformations include syntactic modification, inversion of word order, creation of word pairs, split-up and recombination of locutions, creation of word clusters, conflation, wordplay, and reversals. 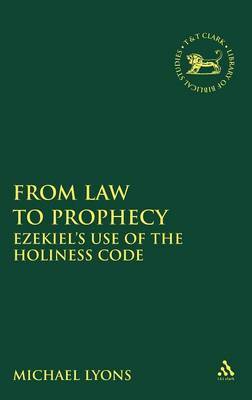 By transforming the "Holiness Code's" legal instructions and covenant rhetoric into accusations and descriptions of imminent or recent punishment, Ezekiel could explain the tragedy by creating a causal connection between the people's behavior and the disaster they experienced. By selectively and paradigmatically using the "Holiness Code's" covenant blessings, Ezekiel envisioned a future characterized by physical and spiritual restoration. Ezekiel transformed law into prophecy in his attempt to meet the needs of his community. Over the last 30 years this pioneering series has established an unrivaled reputation for cutting-edge international scholarship in Biblical Studies and has attracted leading authors and editors in the field. The series takes many original and creative approaches to its subjects, including innovative work from historical and theological perspectives, social-scientific and literary theory, and more recent developments in cultural studies and reception history.